Here at the Group Real Estate in Idaho Falls, we have a wonderful camaraderie with one another. And one of the things that we truly share, as we go out selling Homes in Idaho Falls, smashing records in the Snake River MLS, we love to conquer. Now, I am not trying to take the arrogant side of this, or go the cocky route, utilizing this word. This word can truly be misconstrued all too often and the overly confident way of using it can give off a negative connotation. As we go forward selling homes, listing homes, working and collaborating together, we utilize one thing together: to conquer our day. This is the way we look at. Taking our day to day by the horns and conquering the day, each and every day. 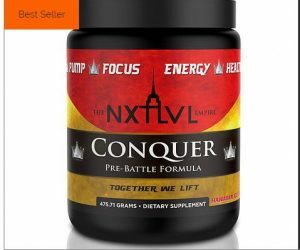 Over at the www.nxtlvlempire.com, you can find a supplement there called Conquer. It is labeled as a pre-battle formula and the reason for this, is it is a supplement that will be there to assist you in your day to day, at any point in the day. A lot of athletes wil use it to make sure that they are getting the most focus and energy for their workouts. The amazing part of the formulation for this supplement is you can use this in your day to day as you go through hard days of work, school or just needing that “pick me up.” This is the supplement for you. This product includes a supplement called Alphasize GPC, which helps in boosting brain function and mood, will improve your focus and connections to muscles you utilize on a day to day. As you go forward in your day to day, no matter what your job is, this is the best boost you could ask for. As your mood and focus enhance, you will not be beaten down by the sluggish 2 o clock drawl that smashes so many of us, so you will be able to continue forward with working through the remainder of your day. We all know that having water intake and getting fluids in through out our day help so much, with this product, the inclusion of Creatine HCL, it helps with better water and fluid absorption into the body, which helps with overall recovery in the body, no matter what you are dealing with, or going through at work. Caffeine Anhydrous and Acetyl L Carnitine are in this, as well, and going along with getting brain function and mood enhanced and going, these add to that. One specific function for these is the added energy that you will get from them. What is nice about these, is they are clean energy, that come from clean sources. Think about clean energy, that is so needed and spoken of in our world, a way to have lasting energy in your home but it is clean on the environment. These are the exact things that happen for you and your body when you are taking these supplements. Clean energy. If these small facts about the supplements haven’t given you the specific things that you know you need, and want, in your day to day willingness to conquer, then the taste of the supplement is what will drive the answer of whether or not you will want it. The flavoring is second to none as to why you should get on this supplement. The peach mango flavor tastes like drinking peach ring gummies. And who doesn’t love peach ring gummies? As a last ditch effort to get you hooked on this great supplement, there is 250 mg of Vitamin C in every scoop. This is vital for growth, development and repair of all body tissues. The main vitamin we always heard about, growing up, that had such importance. Along with so many other wonderful supplements in one, this is the catalyst to a better way of moving forward in your goal to conquer your day. Do yourself a favor, go to nxtlvlempire.com and pick up your bottle of Conquer today and start on your road to conquering your day. We all need to have goals. Day in and day out. This is the best route to getting you on the way to accomplishing your goals.